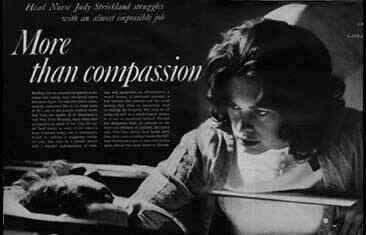 Top: Head nurse Judy Stickland works a 42 bed ward in a busy 1970's NYC hospital. Bottom: LIFE Magazine* opening, nurse Strickland checks on a sick patient. (continued from above left) overseeing their implementation by her nurses and tracking every treatment program for effectiveness. But beyond those duties, her job also made her an emotional anchor in moments of crises. One such crises came when a woman, ravaged by years of in congestive heart failure (right) whom Judy had befriended, told the nurse she would refuse any further treatment. 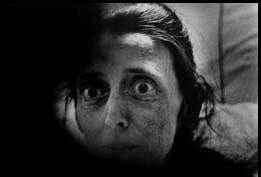 In a fractured moment, standing at her bedside Grey captured both the pain of caring in Judy's face(above left) and the patients harrowed expression as in effect, she signed her own death warrant. "When you have to tell the family--that's when you see death and understand it, written in the faces of the living. That's where you feel the pain of failure. All you can do is offer to hold and hand and help them leave. There's a great emptiness in such moments; I try very hard to forget them..." Judy Strickland. Above right: A 1970's NYC hosptial patient with congestive heart failure decides to refuse future treatments. Above left: Judy Strickland comforts Mrs. Michael Connato who has just learned her husband is terminally ill.